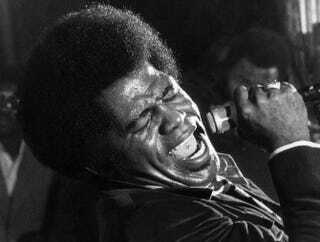 In this file picture taken in September 1971, James Brown performs at the Olympia hall in Paris. From the vocal inflections of his soulful voice to the electrifying dance moves, stunning audience interaction and a theatrical flair for the dramatic, James Brown left a lasting influence that’s apparent to every student of American music. With the upcoming biopic Get on Up, old fans and younger ones alike will get a chance to immerse themselves in the contagious funk and emotional story of the Godfather of Soul. During a press event in New York City, the cast—including star Chadwick Boseman and co-stars Jill Scott, Nelsan Ellis and Dan Aykroyd; executive producers Brian Grazer and Mick Jagger; and director Tate Taylor discussed the making of the film and the singer’s incredible legacy. “I met Mr. Brown about 16 years ago. I’ve met a lot of interesting people on the journey, and I thought it would be interesting to make a movie about James Brown. I transitioned from that point to convincing James Brown that I should do his life story, that I should make it into a movie," said Grazer. Born May 3, 1933, in Barnwell, S.C., Brown became one of the greatest performers in the world. His career ran the better part of six decades and has influenced nearly every performer who followed him in one way or another. But the new film on his life isn’t the first time Brown hit the big screen. The real James Brown amassed a formidable filmography that featured such fan favorites as The Phynx (1970), The Blues Brothers (1980) and The Blues Brothers 2000 (1998), Doctor Detroit (1983), Soulmates (1997) and Undercover Brother (2002). Brown was also featured in more than a dozen documentaries and concert films. The Rolling Stones lead singer experienced Brown’s flair for the dramatic up close and personal. A scene in Get on Up recalls the moment when Brown upstaged the Rolling Stones during a performance on the T.A.M.I. Show in 1964. Jagger says he was a fan of Brown’s as early as 1958.